Mai te urunga o te ra! Ko Whangaokeno! – No nga whatu taiohi. To celebrate Māori Language Week, we hear from Trudi Ngawhare, Kaitiaki, Āo Hāpori and her son about their recent trip to Whangaokeno Island. 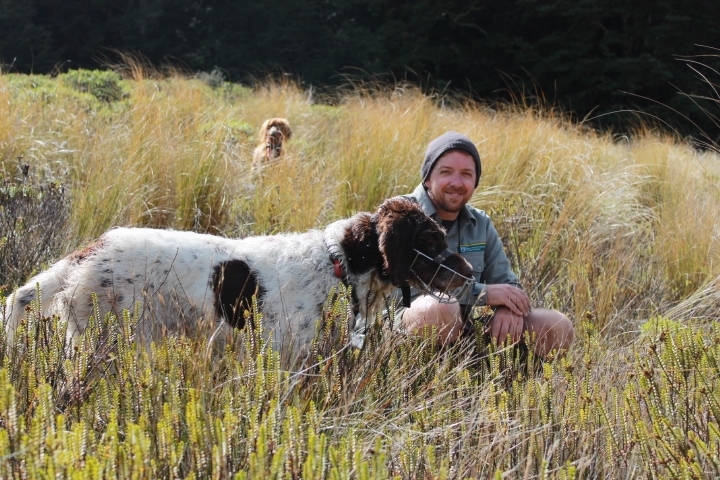 As a ranger based in Twizel the main part of my job is supporting the Kakī Recovery Programme. 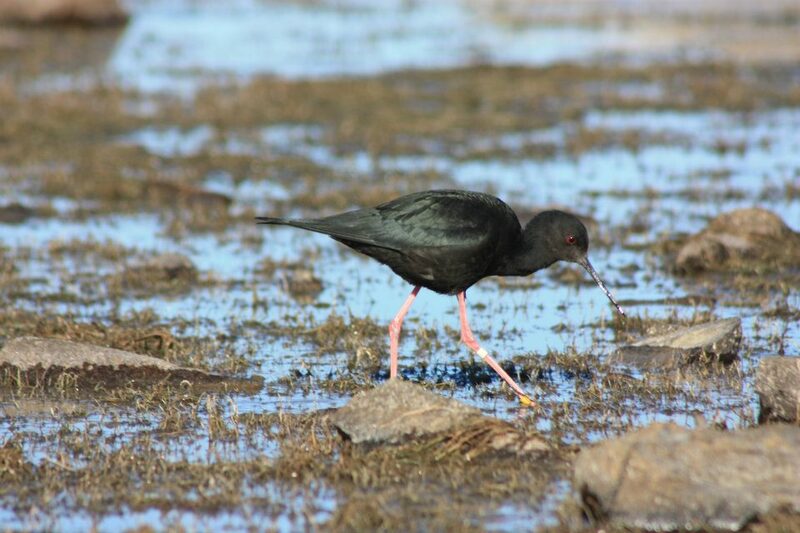 Kakī/black stilts are one of New Zealand’s rarest birds and the mission of the Kakī Recovery Programme is to increase their population in the wild and ensure this special bird is not lost for future generations. As part of a small team of four permanent and a few seasonal staff, my responsibilities involve managing kakī in the wild. This includes counting how many adults are out there; traipsing up and down numerous braided rivers in the Mackenzie Basin searching for breeding pairs; observing and interpreting behaviour; finding their nests; reading leg bands; and collecting eggs from the wild to bring back to the captive rearing facility in Twizel. Walking up and down large braided rivers isn’t for everyone, particularly if you don’t like uneven ground, stumbling around, getting your feet and other body parts wet, super hot days with no shade, howling winds, abrupt temperature changes, long periods of time staring through a spotting scope with one eye, and your lunchtime sandwiches turning to toast upon being exposed to the dry alpine air. However, the alpine views are breathtaking, and the chance to see wildlife that manages to scrape out a living in this environment, is definitely worth a trip to this part of the country. The eggs I collect are brought back to the captive rearing facility in Twizel which is also home to a number of kakī pairs for captive breeding. 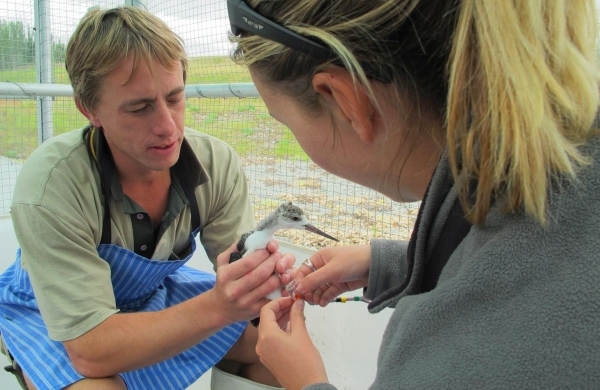 The facility is where kakī eggs are artificially incubated and the young chicks are raised in captivity. At 3–9 months they are released into the wild. Rearing them in captivity significantly increases their chances of survival by preventing predation when they are most vulnerable and it also gets them through their first winter, which can be tough for young birds in the wild. Nick Tomalin was a volunteer with at the captive rearing facility last summer while on sabbatical from The Royal Society for the Protection of Birds in the United Kingdom. Nick’s help was hugely appreciated at the busiest time of the year, and he managed to film a great short video about the work that goes on at the facility. 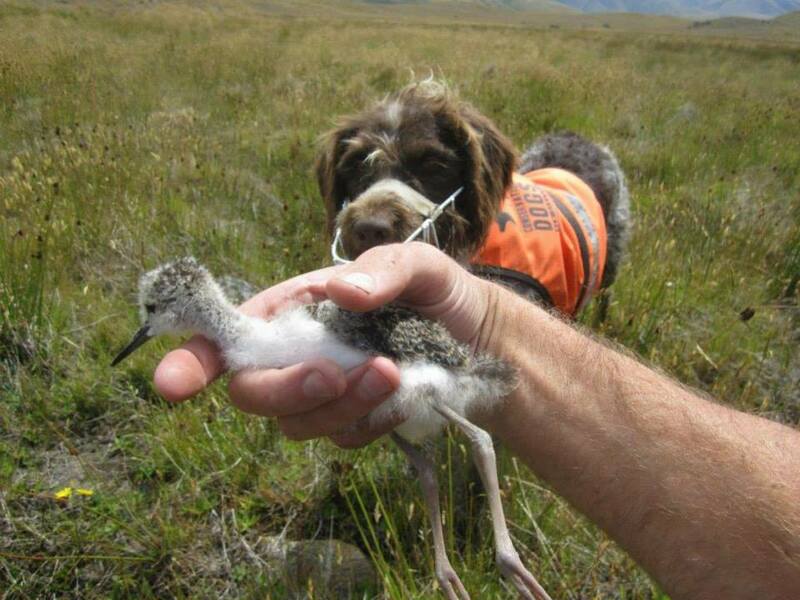 You can keep up to date with the work of the Kakī Recovery Programme on Facebook and on the DOC website. What do an All Black and a DOC takahē ranger have in common? Tricky footwork and some good catching skills! Nifty cornering and tackling are a pre-requisite for catching a takahē in a small pen, but substitute that pen with a 50,000 hectare mountain range and you really have your work cut out for you! 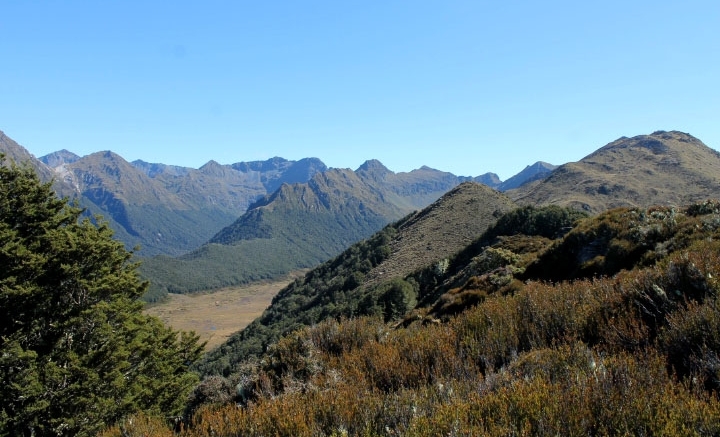 In early autumn the ‘Tark Team’ (DOC takahē programme rangers based in Fiordland) headed off into the Murchison Mountains to catch takahē. We wanted to get an idea of how many chicks had successfully hatched over the summer, fit them with identifying leg bands and transmitters and change some transmitters on adult birds. It was also a good chance to get a rough census of the wild takahē population too. Luckily for us, about half the birds in the Murchison Mountains are fitted with transmitters which helps narrow the search considerably. We also had our team supplemented with some specially trained DOC species dogs, including takahē tracker extraordinaire “Yuki”. But it still didn’t all go our way. 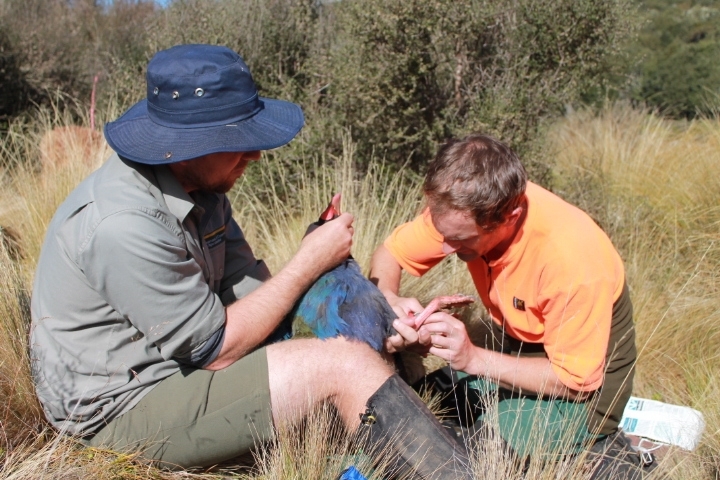 We used the radio signals emitted by the transmitters to locate the takahē in the large alpine basins. Alternatively the dogs would signal the presence of birds without transmitters. Then, hunkered down behind tussocks, we played recordings of takahē calling to coax birds toward us, or at least get them to call back and reveal their exact location. Takahē are territorial and will often reply to the call and even move to intercept an interloper. Our strategy seemed sound, and it worked… mostly…sort of.. except for those birds in Takahē Valley who consistently evaded us. If you’ve ever seen a takahē, they look large and slow and act quite casual and relaxed. But be aware that it’s all a front. They are fast on their feet and amazingly skilled at ducking and dodging. Our best hope of catching them was when they froze under a tussock thinking we couldn’t see them. The trouble is quite often we couldn’t… and once we could they were gone! Here’s where I admit I’m not an experienced takahē catcher. Scrambling through and over thick scrub is not a problem and launching into a dive tackle is okay, but the speed that the birds can change directions and appear somewhere completely different to where they were the moment before, is mind boggling. Thankfully we do have some experienced folk so, if the All Blacks coach is looking for a new wing, I can recommend ranger Glen. Second five eight call ranger Martin and for an open-side flanker you just couldn’t bypass ranger Phil! The good news is we’re fairly confident that this season we’ve got 8-10 new takahē chicks in our wild population in the Murchison Mountains. The other news is sometime soon we’ll be spending a few more days trying to catch those birds that outsmarted and evaded us in Takahē Valley.